Santa Clara County Sheriff's Office investigators believe the suspects in a violent Cupertino home invasion Sunday night went searching for victims. 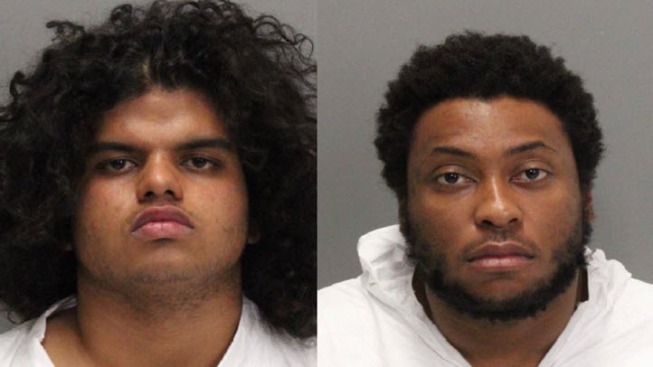 Deputies arrested 20-year-old Yasindu Desilva of Santa Clara and 21-year-old Jacks Atiba of Sunnyvale for allegedly robbing a couple at gunpoint, as well as brandishing a knife, and stealing cash and jewelry. Investigators said there are reports the two suspects went around the Regnart Road area knocking on doors. Investigators point out burglars typically knock on doors to make sure no one is home. "But what's concerning about this case is that they are knocking on doors in what appears to be to find people that were home," Santa Clara County Sheriff's Sgt. Richard Glennon said. "To have them go into the house and lead them to their possessions." Investigators said the two men saw an open garage door and walked in. "They're going to make those assessments on who's home?" Lt. Elbert Rivera said. "If they can overpower maybe one or two people." The big break came when deputies responding to the victim's 911 call saw a car driving at high speed about a half mile from the robbery. After a brief chase, deputies cornered the suspects, who surrendered. A loaded gun and knife were found in the vehicle, officials said. The Sheriff's Office said these types of arrests are dangerous, especially since one of the suspects is on parole. "Someone that is on parole you are concerned that they're escalating," Glennon said. "That they're willing to take it to the next level to become more violent." Investigators are still talking to the alleged home-invasion victims and checking to see if the suspects might be connected to other robberies.